Following Matt Ritchie’s last-gasp equaliser to rescue a 2-2 draw at Bournemouth on Saturday, a staggering statistics did the rounds on social media. Indeed, after 31 games, Rafa Benitez’s side have an identical Premier League record to the one they had at this stage last season. That includes: the same number of points, the same number of wins, draw and defeat. The same number of goals scored, conceded and the same goal difference. The only statistics that slightly differs is United are one place lower in the Premier League table in 13th. It’s astonishing, bizarre, and it has brought plenty of social media reaction from Newcastle fans. @UptheMags: "Probably finish with more points and a worse spot in the table. I bet more goals too with and easier run in and some competent attacking options. But this is still pretty amazing." @ToonPolls: "In game 32 of last season, we beat Leicester 2-1. 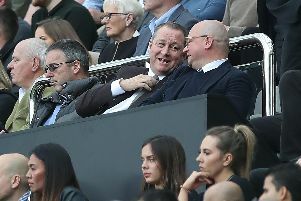 Get your money on Arsenal 1-2 #NUFC on April 1st." @iancoates1963: "Great improvement on last season, no money spent, no change." @Kevwoodh24: "Consistency though. Same form that helped us finish 10th." @onishola2000: The team is growing and making positive progress. Sue Rigg: "At least we are consistent." Alan Hall: "So, no improvement on last season." Jimmy Christelow: "Consistent if nothing else." RaJa PB: "The man's a magician."